EOS/USD increased a little in the last days as the Bitcoin has managed to increase again. We’ll see what will really happen in the upcoming days because it is still premature to talk about an important upside movement at this moment. 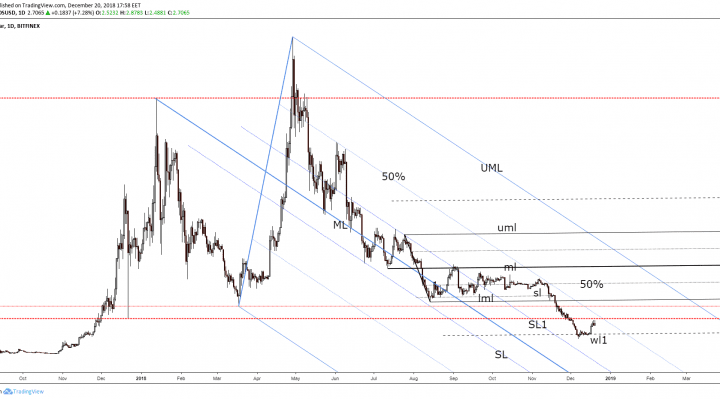 Bitcoin increased, but it is still trapped below a very, very strong dynamic resistance. Personally, I would have like to see a significant consolidation before the rate will really start an upside movement. 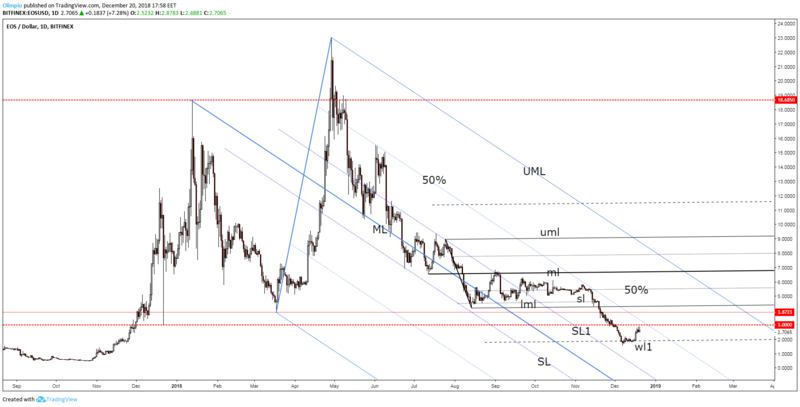 EOS/USD has shown some oversold signs, but we need more than that to consider going long again. You can see on the Daily chart that the rate has failed to approach and reach the inside sliding line (SL1) signaling an oversold. Price rebounded and maybe it will try to reach and retest the 50% Fibonacci line of the major descending pitchfork. Resistance can be found at the 3.0000 psychological level as well. So, only a valid breakout above these levels will give us a first signal that we may have a potential upside movement. Persoanally, I would like to see a breakout above the 50% Fibonacci line followed by several retests and followed by one or two failures to retest the 50% line, this will be a significant bullish signal. The rate is already very low, so, we have to wait for a bullish signal. It has found a strong support on the first warning line (wl1) of the sideways movement and now it could try to come back to reach the lower median line (lml). You should know that a failure to reach the 50% line or a false breakout will send the rate down very quick.